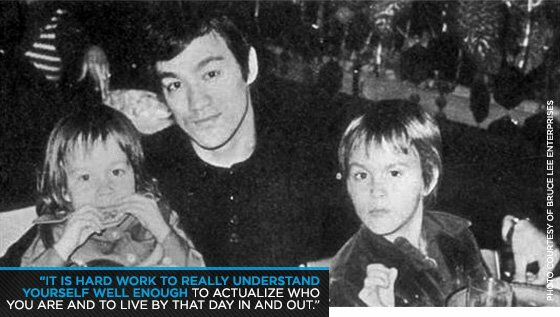 Perpetuating The Bruce Lee Legacy: Shannon Lee Discusses Father's Impact (Part 1)! Shannon Lee reveals her personal insights concerning the man so many have come to love and admire. 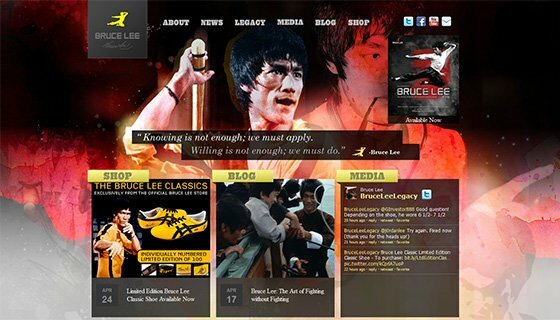 Find out more about the legacy that is Bruce Lee! Much more than a martial arts phenomenon, screen legend Bruce Lee—upon his untimely passing on July 20, 1973, at age 32—had become a global sensation. Known as much for his philosophical teachings, film pioneering efforts and insistence on self-discovery through, in many cases, the breaking of rigidly enforced boundaries to personal growth as he was for his technical proficiency in and revolutionary thinking concerning the martial arts, Lee became the world's most widely admired and undeniably dynamic public figure. Being the perpetual student he was, Lee gave his fullest attention and zeal to any project he undertook spending hours studying every aspect and becoming proficient in all areas of his craft. Knowing this it is therefore no surprise that his acting talents transcended the martial arts action genre to where he was able to bring a level of humanity and charisma usually found lacking, even until today, in many of his contemporaries. 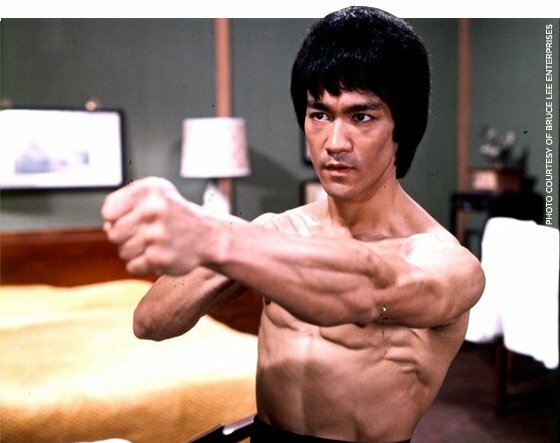 And being the consummate martial artist, arguably the greatest complete martial artist of all time, his fight scenes were as authentic as they were powerful and energized. Through his movies, as in life, Bruce Lee was also able to challenge the racial stereotypes governing and the orthodoxy surrounding the monopoly his countrymen proclaimed to have on the Chinese martial arts. Upon making America his home, Lee even went so far as to openly teach traditional Chinese martial arts' systems to his western students—an act tantamount to treason in those times—attracting much derision from the local Chinese community in the process. As strong to his principles as his body was in combat, Lee never wavered and proved that with strength of mind and commitment to one's cause, all things are possible. Indeed, the worldwide martial arts movement of today's existence was made possible in large part through Bruce Lee's vision, influence and example. Bruce Lee's legend is as strong today as it ever was. The man known to many as The Little Dragon continues to inspire through his immortal cinematic works and the knowledge he passed down to those with whom he worked and influenced. Today his legacy lives on, not only in the people who have been influenced through his actions but through the efforts of the Bruce Lee Foundation, a pubic benefit corporation that seeks to preserve, perpetuate, and disseminate his life example, philosophies, and art of Jun Fan Jeet Kune Do. With the passage of time Bruce Lee's image and name have maintained their integrity and his brand has not become overly commercialized. Though his teachings—both martial arts related and philosophical—continue to impact thousands worldwide and considering he remains in the public consciousness through his movies, his legacy has retained its purity. One person seeking to ensure this continues is Shannon Lee, only daughter and youngest child of Bruce Lee and his wife Linda Lee Cadwell. An actor in her own right, and executive producer of the 2008 television series The Legend of Bruce Lee, Shannon has grown with the wise words and insightful philosophies of her father close to her heart and firm in her mind. 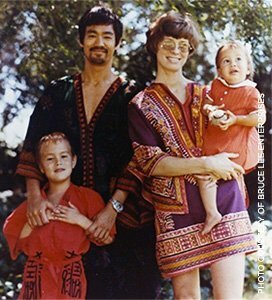 As current President of the Bruce Lee Foundation it is her role to ensure that her father's life and times continue to inspire and educate. In the following interview Shannon Lee reveals her personal insights concerning the man so many have come to love and admire, a shining light of strength, perseverance and courage whose example will live on for all time. Hi Shannon. First of all could you please provide me with a little background on yourself and your acting career? 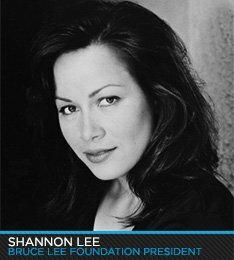 Shannon Lee: Well I had an acting career for a little while back in the 90s. I had gotten into that because I was interested in acting, but I was not really as centered as I needed to be to fully pursue that career, and I was doing some films I thought were not of the best quality. I really enjoyed doing action but I found that a lot of the action offerings were just not that great, in terms of being good movies. So I decided I wanted to take a break and I also had my daughter at this time. So around that time I started taking more of an active interest in my father's legacy and what was happening in terms of the commercial side as well as educational side. Toward the end of 2000 I began getting involved more on the licensing side of things. Then in 2002 I formed the Bruce Lee Foundation, which is a California 501c(3) non-profit public charity. The basic mission of the charity is to preserve and perpetuate my father's legacy. That is my mission always, regardless of what it is for, but through the foundation it will basically be through educational means that we accomplish that. We have seminars in Jeet Kune Do, we have scholarship programs and we are putting together educational programs for youth organizations. Those are in process at the moment, as we speak. And then we have long-term goals of building the Bruce Lee Action Museum. The Bruce Lee Action Museum will represent action in the sense that the word is not just used to mean action in the martial arts or films. It is really meant to be a much broader definition as far as taking action, my father's belief of self-actualization. So it is really about looking at that in a broader sense and taking into consideration all of the different meanings behind action and how to be proactive in your own life, in the ways he was proactive in his own life. As well as the entertainment factor: his films and that kind of thing. As you seek to expand the Bruce Lee brand with the launching of the new Website BruceLee.com and the undertaking of licensing associated with your father's name and image, what marketing possibilities present themselves? Shannon: Well there are definitely a number of things. Bruce Lee was for many years represented by Universal Studios and it was just last year that we retrieved the rights back from Universal to be able to license Bruce Lee ourselves. We opened an in-house licensing division and we are really excited about that because we really feel that my father's legacy has so much value, and I don't just mean financial value. I mean that it has real value in terms of having what he stood for still be available to people around the world. He's a hero to certain people he stood up for. He promoted the idea of breaking barriers and really expressing yourself. And we just think that, not only through the work of the Foundation, but through many different types of projects that we can continue to get that message out there. So we are looking at a lot of different things at once. We have formed Bruce Lee Enterprises, which is our in-house licensing division. And we also formed the LeeWay Media Group, which is also our production division. We really feel like it is time to get new and fresh Bruce Lee production content out there. And so a number of the projects we are working on are Broadway musicals, an animated film project, a Chinese, more-territory specific language biopic and also a GC film where we can bring him back through computer generated image technology. You bring him back to the big screen essentially. There are many different licensing opportunities from big to small. Everything from T-shirts to video games, so we really have a strategy we are working with as far as how best to bring him back into the consciousness in a much fuller way. And of course there is the Website, which plays a huge role in all of this. We had to get the Bruce Lee URL BruceLee.com back from a cyber-squatter, which took a bit of time because he didn't want to relinquish it even though he was not using it as a fan site; he was just using it to drive traffic to his own businesses. So it took time to get that back and to create a vision for the site itself, and of course we are building on that every day. How will you balance the marketing of your father's image with a need to maintain the integrity of his image? Could there be, with greater commercial opportunities, a problem with the Bruce Lee brand's purity being affected. Shannon: There has been no problem so far. Mostly because my father's legacy lends itself so well to such a diverse range in the sense that he has that straight-ahead entertainment value, action, powerful, graceful persona that so many people know him by and that has a lot of entertainment to it. To be able to capture that is terrific. In some ways the totality of his legacy is probably new to a lot of people because I think many know him primarily as an action Kung Fu movie guy from the 70s. But the depth and richness of his legacy is what we are really trying to bring around to show people that he represents a lifestyle, not just action movies. So I really don't see a problem in having not enough to work with and I have not, as yet, run into any problems with trying to represent his legacy in a true way. Did your father leave behind any unpublished written works? Shannon: Yes, there are some things that are unpublished. Obviously a lot of his writings have been published; mostly his writings on martial arts and philosophy have been published, but there are actually a number of unpublished creative writings like screenplays and multiple television series and things like that. So we are definitely utilizing those and there are definitely some unpublished things, including photographs and the like. In what ways has your father influenced your own career? Shannon: It's funny; he influences me every day, most definitely. And I would say that's grown more as I have gotten older. I think that in a lot of ways I've acquired a certain amount of maturity in order to be able to mine the wealth of what his legacy is and what his philosophical teachings are. I started studying Jeet Kune Do in my early 20s. I studied it briefly as a child but had for the most part shied away from that as a kid growing up, and I think that it was probably because it was physical. But as I got older I really wanted to understand what that was, so I started to study martial arts and Jeet Kune Do and began reading a lot of his writings. There is so much richness there, every day. When I pick something up and read it I can just apply it so directly to my life and the idea of really walking my own path. In my 20s, when I was acting, I probably had a little bit of a personality crisis in the sense that everybody related to me as Bruce Lee's daughter. But what I've grown to learn is that the real message of his legacy is about walking my own path and I can best live up to his legacy and who he was by being myself and not by trying to be him, and that's really freeing. It still requires a lot of work and I have to say that it is hard work to really understand yourself well enough to actualize who you are and to live by that day in and out and to really be in the moment with that. It's a lifelong process so I still consider myself in the middle of it. What of your father's martial arts talents have been passed down to you? Shannon: (Laughs) I guess I'm blessed to have sort of a natural athleticism; I've played sports my whole life and I'm fairly physically coordinated and can pick things up quickly, which is something my brother can do and my father definitely could do. I wouldn't say I'm necessarily in the same league as them though. I also probably haven't put in the same kind of effort that they did during their lives as well. I've definitely tended a little bit more towards the artistic side in terms of writing and being creative with my own businesses and my own projects. I guess I do feel that to a certain extent there is something, whether it is things that I was taught and picked up on as a toddler - that are in my subconscious somewhere - or if it is genetic to a certain degree, but I definitely feel that I am in touch with the essence of my family's legacy and have a sense for how to process a lot of what comes my way with regard to Jeet Kune Do and his own philosophical writings and things of that nature. And what of your father's philosophies has impacted you most do you feel? Shannon: I think the thing that has become so clear to me over the years is—and obviously my father had a certain amount of natural ability—that he worked really hard, and I think that a lot of people don't know, or they don't see that side of it. And I came to see from looking at everything he was doing on a day-to-day basis that he achieved what he did from life because he really focused on it and put in just a huge amount of effort in terms of whether it was fitness and nutrition, just anything. Any project he chose to take on he put 100 percent into. And he was able to leave behind so much because he was so directed in his energy. I would say that if there is anything at all that I sometimes see in myself—something that I could do better—is to really focus my efforts in that way, in that amazingly committed way. It's something that I'm continually striving for and working on. The idea of not getting bogged down on set patterns and really trying to work more intuitively in the moment, and being the constant student and never feeling like you are at the top of your game, but always wanting to continually learn and grow. It's having the feeling like if you can conceive of something, then you can do it. You just have to keep trying and trying. Your father also used the example of a tree trunk with all of its many branches as a metaphor to explain the many life directions we can take and excel in. Shannon: One thing that he said about the tree is that what you are after is the roots, that the branches are really the surface. The branches are the things that people can see, but what you are really after is the roots. That the branches are often the showy part but the tree has nothing without its roots, and those roots have to be really solid and they have to be deep: that is really what you are after. Establishing a platform for future success. Shannon: Yes, and that you really have to know solidly who you are and work from that core, not look at other people or other personalities that you want to emulate, that you really want to look inside yourself and work and cultivate those parts of yourself that are unique to you. And as you go along in your life, really work to express that core person that you are. And staying rooted in that rather than being carried off in one direction or another by something else. I don't really see that the tree branches represent the cross training in martial arts. I see them as being the fruits of his labors but his labor was on a much more deep and personal level. 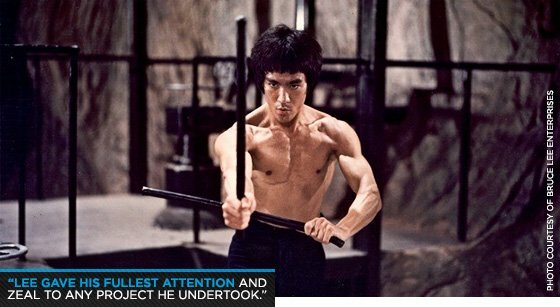 Bruce Lee was an incredibly focused man possessing an amazing level of energy, as you spoke of earlier. From where did he draw such boundless energy? Shannon: I guess I don't 100 percent know where that energy came from, whether he was just born with it. I know he basically had the heart and soul of a true explorer. He was constantly testing everything that came into his purview. He understood what truth was in terms of the things that piqued his passions. Martial arts, I think, was his number one passion and he felt like that spoke to him in his lifetime. And everything else—including the movies—was born out of that passion for martial arts. I think he saw making films as a way of supporting his family and also a way to convey some of his beliefs about martial arts and that his teaching of martial arts was really a window into his own soul. You can train in martial arts but when you try to relate to someone else what it is that you understand it starts to crystallize for you. And I think at the point when he started to train and have some real matches he really began to open himself up to certain ways of thinking, or ways of not thinking, that he really grew as a person generally. He has a famous quote: "All knowledge ultimately means self-knowledge." In some ways he was like a major explorer. But instead of getting on a ship and conquering new worlds he was conquering other worlds such as the martial arts. And all of his philosophy he applied directly to his martial arts. The influence your father has had on millions of people worldwide has been phenomenal. How large an influence does Bruce Lee have today? Is it as big today as it was in the 70s? Shannon: As far as I can tell, yes. But I think that it is time to create some new projects so that he can continue to be out in front of the public today. For instance, we just did a documentary for the History Channel that came out earlier this year called 'How Bruce Lee Changed the World'. It showed the way he had influenced and affected so many different genres, from film making to martial arts to MMA, free running and music and philosophy, culture, nutrition and fitness. It just goes on and on. There are people who are out there doing these things today who can directly tie this back to the influence of my father, so I definitely think it is alive and well today.